The new Apple MacBook 2015 is certainly ultraportable, but there are significant compromises. 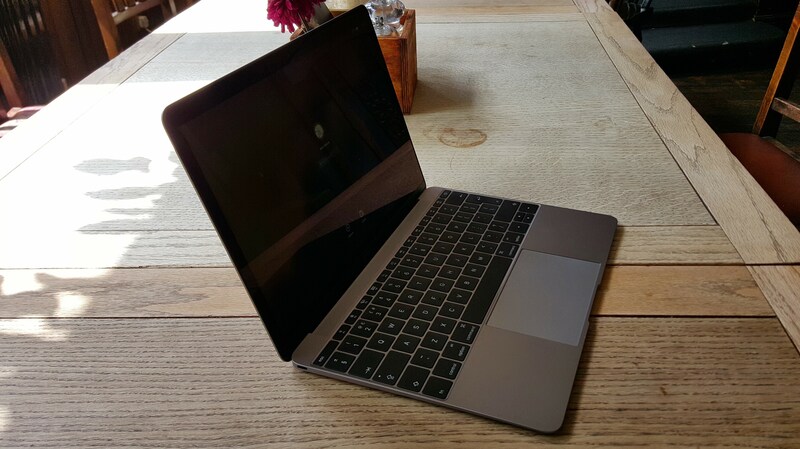 As an ultraportable the MacBook 2015 has to be high on the list of most desirable and the most, well, portable. It’s a whopping 0.35cm at its thinnest point widening to an epic 13.1mm, and weighs 907g, but crams in a fullsize keyboard. A retina display and uprated keyboard/trackpad round off a pretty impressive technical package, even given the £1000 entry asking price. However, as you may have read (unless you’ve been under a rock of late), there’s only one USB C port on the whole machine (bar the headphone jack), and this has a major impact on general connectivity. Of course, as Apple would claim, everywhere has fibre and 802.11ac wifi now, right? Well, obviously not. We’ve been testing the MacBook 2015 in and around London to find out how it stacks up in real life, as well as in theoretical benchmarking tests. The new USB Type-C charging cable has that unmistakable feeling of a first draft from the product development team. The laptop end is a stiff fit, and has none of the subtlety that Apple has built a reputation – and considerable fortune – on, being just a double-ended USB Type-C cable. No Magsafe here squire, and that’s a real shame, we’ve all had a MacBook saviour moment thanks to Magsafe, right? That Intel fanless Core M CPU is certainly silent, but it’s not the beefiest of options out there. However, Apple has gone for the thinness factor rather than power here, which is an understandable trade. 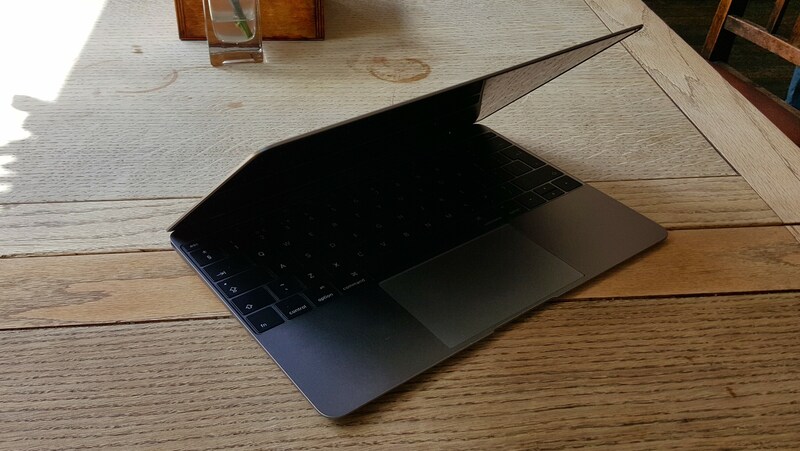 The thinness is also down to an ingenious terraced battery arrangement, and a dramatically thinner keyboard. This last has scrapped the old-school scissor mechanism in favour of an intricate Apple-invention, the butterfly key mechanism. The battery life is one bit of good news for everyone though – new out the box you’ll be getting a full day’s office use without charging, which is as good as you could expect. We’ve finished some days with a solid 30% battery in the bank after an 8 hour day, which is certainly something to be chuffed about when it’s pushing photons out of a Retina-resolution screen all that time. To balance that out, the ultra-thin keyboard will polarise people. it’s positive in use, and is surprisingly easy to get used to, as well as being accurate and comfortable for all-day writing sprees. However, it’s never luxurious, never plush. The experience is rather like typing on a touchscreen, with very little key travel and resistance. Very much worth trying before you buy, if that’s possible. Unsurprisingly, the price here is considerable, even for Apple’s eye-watering standards. 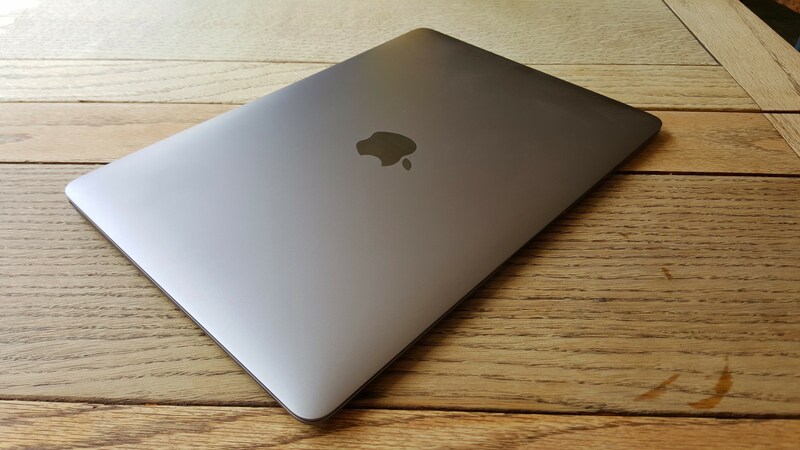 Starting at £1,049, the entry-level MacBook comes with 256GB of flash storage and is powered by a 1.1GHz (Turbo Boost to 2.4GHz) dual-core Intel Core M flash storage, 8GB of RAM and Intel HD Graphics 5300. if you’re keen to spend more, the upper-end model comes with a brisker 1.2GHz chip (Turbo Boost up to 2.6GHz) and 512GB flash storage, for a salty £1,299. Broadly speaking, you’re in MacBook Pro price territory here, so be sure you’re keen on ultimate portability and low-power processors before considering this beast. Overall, this is a classic slice of Apple hegemony. its beautiful, ultra-light, and everything but the processor is tip-top quality. Needless to say the engineering is impeccable, and the price is to match. There are significant compromises made to get to this point however, so if processing power, ports or price are top considerations then a cynical eye is required. Could 3G iPhone be on its way?